This simple recipe can be filed under “What to do with leftover grilled steak”. I know that may sound crazy to some people. I mean who often has leftover grilled steak laying around the house? Well, we do…..on a regular basis. This is because when Erik grills steak, or anything really, he often grills enough to feed a small army. I don’t know if it’s a trait leftover from his culinary school days, but he always seems to cook in bulk. But honestly, this works out great for me, because when he is working through the evenings during the week, it gives me something to base my weeknight dinners from. One of the easiest (and tastiest) leftover steak meals is a nice satisfying steak sandwich. 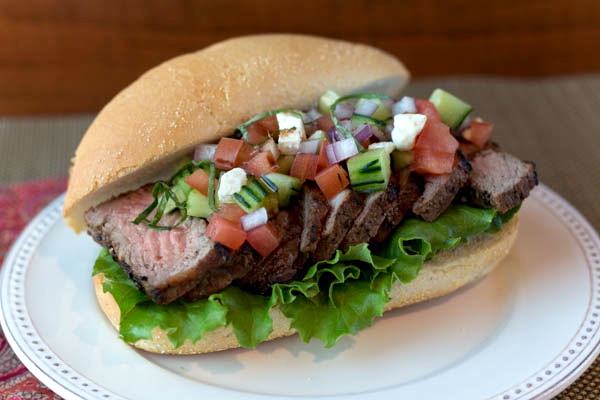 The great thing about this meal is that you don’t even have to reheat the steak, just slice it up, dice up your veggies and gather it all on a hoagie roll and you are good to go. 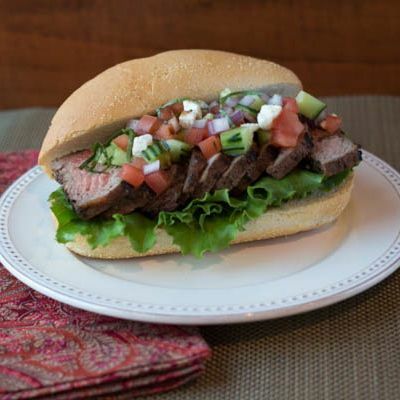 So the next time you are grilling steak, make sure to throw a couple extra on the grill so you can indulge later in the week in this easy to make, tasty steak sandwich! Need some pointers on how to grill up some tasty steak? Check out this post from our site: Perfectly Grilled Sirloin. Thinly slice the grilled steak. Place one piece of green leaf lettuce on the bottom of a roll. Place several slices of steak across the roll. Sprinkle on top the tomato, red onion, cucumber, feta and basil. Drizzle some olive oil and balsamic vinegar on top and spread hummus on the top roll if desired. Enjoy!